Hasbro has unveiled RealD 3D glasses-toting masks in the shape of Transformers characters – allowing you to stand out from the Blues Brother throngs at the local multiplex. With the spate of novelty and designer 3D specs hitting the market harder than a late 80s Mike Tyson it takes a lot to impress TechRadar, but we can't help but admit out inner child is warmed by the concept of turning up to a film in an Optimus Prime mask. 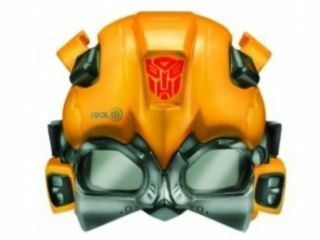 Bumblebee masks are also currently being produced between RealD and Hasbro to tie in with the next Transformers film titled Transformers: Dark of the Moon. We are currently trying to find out if there are any plans for a UK release, and just how much we'll have to fork out for one. We'll be sorely miffed if the masks aren't big enough for our adult-sized heads, but we are hoping the movie industry can go one better in the future. Because we are already looking in the direction of George Lucas and suggesting that if nobody is already assembling Stormtrooper and Darth Vader masks for the 3D remakes of Star Wars then we'll be banging on the doors of Skywalker Ranch and asking why.